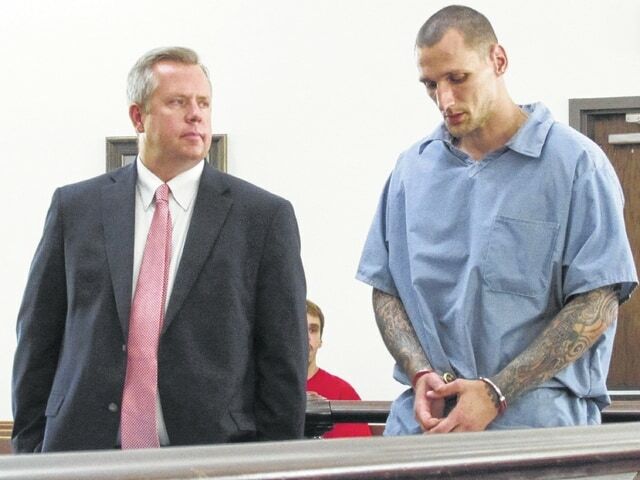 Mycal Mains is pictured Wednesday as he speaks to the court prior to his being sentenced. Defense attorney Lee Koogler is also shown. A Highland man has been sentenced to five years in prison following his plea of guilty to starting a fire at the Highland County Justice Center in early 2015. Mycal Mains, 31, pled guilty in two cases and was sentenced to four years in prison on second-degree felony aggravated arson and one year for third-degree felony escape. The five years will be served consecutively to an eight-month term out of Ross County that Mains is currently serving. He said Mains suffered “significant burns” trying to put the fire out himself. “It was … the most foolish thing I’ve ever done,” Mains said Wednesday of starting the fire. He said he was “very remorseful” for what he’d done. “You endangered all the other inmates … and the staff,” the judge said. Mains will be under a mandatory three years of supervision following his release from prison. Additionally, he’ll have to register with Ohio’s arson registry. According to Koogler, Mains’ escape charge comes from a medical furlough the defendant was granted that he never reported back from. A Hillsboro man was sentenced to just two months shy of five years in prison on Wednesday on five drug charges. Shawn Ames, 43, got 10 months each on two heroin trafficking charges and a heroin possession charge, all fifth-degree felonies. He will serve 14 months each on two counts of heroin trafficking in the vicinity of a juvenile, both fourth-degree felonies. Ames pled guilty to the charges in April. He was indicted on 16 counts, but the remainder of those charges – all fifth-degree felony trafficking in and possession of heroin – were dismissed as per the plea agreement. According to the agreement, the state will not oppose judicial release to the STAR program after Ames has served a year in prison. Coss said Ames had an “extensive history,” though the defendant has never been to prison. Ryan Roach, 29, Hillsboro, pled guilty to illegal manufacture of drugs, a second-degree felony. He was sentenced to four years in prison. Any prison sentence imposed for this particular offense is mandatory, meaning that Roach will have to serve the four years in their entirety with no chance of early release. Jason Edward Vilvens, 41, Sardinia, pled guilty to third-degree felony illegal assembly or possession of chemicals for the manufacture of drugs and was sentenced to 18 months in prison. Vilvens is currently serving a mandatory three-year sentence out of Brown County. Once that term of prison is served, Vilvens will begin serving the Highland County sentence. Justin Haynes, 33, Bainbridge, was ordered to serve a year on fourth-degree felony trafficking in methamphetamine. He pled guilty to the charge in May. Shaun Davis, 28, pled guilty to fifth-degree felony heroin possession and was sentenced to 11 months in prison. Davis is currently serving prison terms out of Brown and Clermont counties. The Highland County sentence will run consecutive to the time he is currently serving. Pamela Moore, 54, Hillsboro, pled guilty to fourth-degree felony trafficking in methamphetamine and was sentenced to a year in prison. She is currently serving a prison term out of Highland County. The prison sentence imposed Wednesday is to run consecutively to her current prison term. David T. Errington, 46, Seaman, was sentenced to nine months in prison after pleading guilty to fifth-degree felony aggravated possession of meth. The sentence will run consecutively to a two and a half year sentence Errington is serving out of Adams County for drug trafficking. Rachael N. Parks, 27, Hillsboro, pled guilty to third-degree felony illegal assembly. She was sentenced to 30 months in prison. According to the plea agreement, the state won’t oppose judicial release to STAR after six months of her sentence is served. Kay E. Fancher, 63, Winchester, was sentenced to three years community control. She pled no contest to third-degree felony endangering children in April. She was charged with the crime for failing to protect a child in her care from sexual abuse when she had suspected it was happening. Martin J. Anders, 54, Washington C.H., was sentenced to three years community control and treatment for a third-degree felony count of marijuana possession. He pled guilty in April. Michael R.L. Fox, 34, of Marshall, Mich., was also sentenced to three years community control. He pled guilty to marijuana possession and possession of criminal tools, both fifth-degree felonies, in April. Robert Jay Hogle, 36, Greenfield, was sentenced to community control on fifth-degree felony nonsupport. Collins said Hogle owes more than $38,000 in arrearage, but has recently begun making payments on that. Hogle will be on five years of community control due to the amount that is owed. Chad A. Cline, 37, New Vienna, pled guilty to fifth-degree felony heroin possession and was granted intervention in lieu of conviction. Cline has no previous felony convictions, and if he successfully completes his treatment and does not violate community control, the felony will be dismissed. Matthew Casey Holaday, 34, Sardinia, pled guilty to third-degree felony grand theft. He’ll be sentenced in July. Foryst A. Rios, 20, Blanchester, pled guilty to fifth-degree felony trafficking in marijuana. Rios is scheduled to be sentenced next month. Jammie Hudson, 38, Wilmington, pled guilty to third-degree felony heroin possession. She is set to be sentenced in August. Brandy R. Randolph, 37, Sardinia, failed to appear for a hearing on a case where she’s charged with fourth-degree felony receiving stolen property. A warrant was issued for her arrest.